Security lighting is a great way to protect your home and family from invasion, and the safety and security experts at AlarmSystemReport.com prepared a list of tips to consider when installing exterior lighting at your home. Properly lighting the exterior of your home can significantly reduce the chances of a break in. 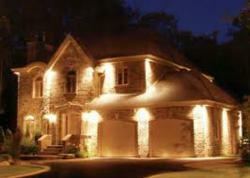 Adequate exterior lighting at your home has numerous benefits. A well-lit home often deters criminals from breaking in, and exterior lighting is also a good way to protect yourself from attacks while you’re on your own property at nighttime. For example, security lighting can not only protect a break-in but can also prevent a mugging or other crimes that may occur if you’re moving from your vehicle to your home, or if you’re outside walking a pet in the dark. Many home alarm system companies offer outdoor security options in addition to indoor security systems, and outdoor lighting is one of these additional options. Outdoor security lighting can either be run by a timer, or motion-detector. Many people opt for motion-detector activated lighting to let them know if there is suspicious activity outside of their home. Many security companies also offer systems that allow you to operate the lighting at your home from a smartphone or personal computer, which can help save electricity when it comes to outdoor lighting. The security experts at AlarmSystemReport.com, a site providing alarm system reviews of the top home alarm systems, put together a list of considerations to keep in mind when installing outdoor security lighting in various areas of the perimeter of your home. 1. When planning outdoor security lighting, safety is a top priority, but design can also be a consideration. It’s possible to plan a lighting design that serves to accent your home, while also providing safety and security at the same time. 2. Install lighting at all entry doors. It’s a good rule of thumb to use a light fixture or lighting solution with two bulbs, because you’ll get a greater area of light, and you’ll have some light if one of the bulbs burns out. 3. For security lighting that is installed under windows, choose a low wattage bulb. A low wattage bulb under windows will allow you to see any activity going on outside, from inside your house. To illuminate windows, install lighting under windows from the ground up, shining through any shrubs and bushes that may be around the window. 4. Add lights along driveways and walkways in your outdoor space. This is a great way to deter burglars and make pathways safer, but it’s also a good place to express creativity with your lighting design. Options for lighting pathways and driveways can typically be more decorative, in addition to functional. Pathway and driveway lights can be posts, lanterns, or even small lights that line the walkway from the ground. 5. When installing security lights under the eaves of your home, point them in a downward direction from the eaves and towards the corner of your house. This will allow for your lighting to cover both sides of your home. If you point security lighting away from your home, it leaves an unlit area, making it vulnerable to intruders. 6. When installing security lights, ensure that you are placing them in areas that are out of arm’s reach, because this will make it more difficult for the lights to be disrupted or destroyed by a criminal. AlarmSystemReport.com is a website operated by security experts, dedicated to providing reviews of alarm and security systems, so that consumers can make comparisons based on comprehensive and unbiased information. The site provides reviews for top alarm companies, including ADT alarm reviews and Vivint home security reviews.